On a recent trip to hubby’s home town, Arezzo, in the beautiful region of Tuscany, to visit Mamma and Babbo (aka the best in-laws a girl could ask for), I made some quinoa for one of our dinners. Since my diet is “strana” for the average Italian, mamma is often at a loss of how to feed me, so we’ve taken to cooking together to make things easier. She usually calls us while we’re in the car on the way down and takes an inventory of the ingredients she needs to pick up for our visit and then heads out to the supermarket to get it all. She’s even managed to find a small organic alternative supermarket that carries all the ingredients I eat which you wouldn’t normally find in the average Italian supermarket (malts, miso, etc…). For our meals this past trip, we made kamut pasta with green bean pesto and brown rice saffron risotto (both recipes coming soon). They opted for take out pizza from a local pizzeria on Saturday night, and I decided to whip up my 5 ingredient cannellini bean spread, some water sauteed radicchio and some quinoa, which I folded into a yeast free kamut wrap. Don’t get me wrong, I love pizza as much as the next person, but I wasn’t in the mood, as my options at this particular pizzeria were limited to marinara and I really need to limit my in take of tomatoes (and nightshades in general) which I had had once already that week. We sat down for dinner, them with their pizze and me with my wrap. Hubby had a bit of quinoa and babbo dug into the cannellini bean spread, which he loved, but mamma was happy to stick to her pizza while exhibiting some curiosity about the quinoa, but refraining from giving it a try. We returned to Milan on Sunday evening, leaving the leftover quinoa behind. A few days later, mamma called to tell me she ate the leftovers and loved it, and she asked for directions on how to prepare it. She’s been trying to incorporate more whole grains into her diet, and was happy to discover that she digests quinoa much easier than brown rice and wants to make it again. So, here are the directions I gave mamma. Quinoa is a wholesome and flavourful ancient pseudograin that has a wonderful nutty flavour in addition to many benefits. It’s easy to prepare, very versatile, extremely nutrient rich and a good source of zinc, folate and vegetable based protein due its high concentration of amino acids. 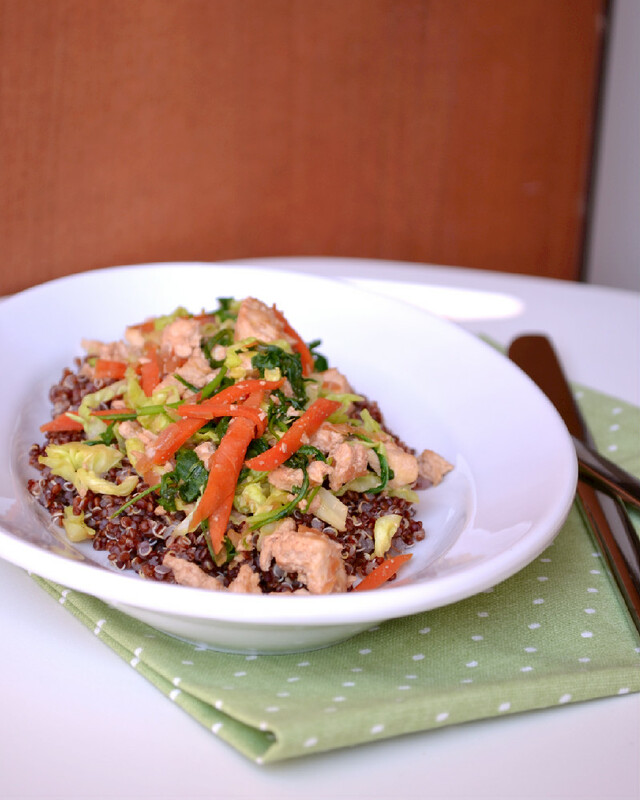 Quinoa also has antioxidant and anti-inflammatory phytonutrients and is naturally gluten-free. It also comes in a variety of colours from white to black. Soak the quinoa in cold water and swish it around with your hand until a soapy residue rises to the surface. Thoroughly rinse quinoa about 3 times until it stops making a soapy residue. This residue is called saponin which is a substance that covers the quinoa and makes it bitter if not rinsed off completely. Drain and let drip for a couple of minutes. Add damp quinoa to a pot, and toast over medium heat for about 3-4 minutes until it starts to pop and dry out. Add water or broth (1 1/2 – 1 3/4 parts water for 1 part quinoa) and bring to a boil. Reduce heat to low, cover and simmer for about 20 minutes until cooked. 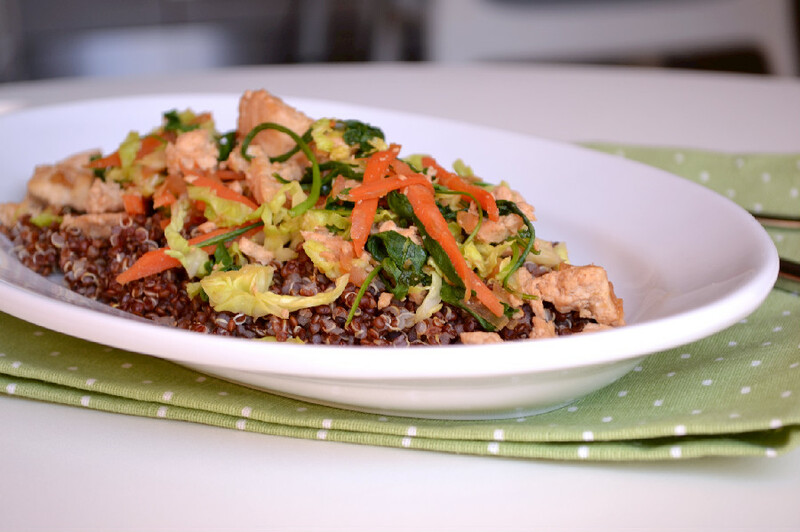 Serve with your favourite veggies and/or protein and enjoy. Here’s a quick and easy recipe to try out with Quinoa, and if this doesn’t tickle your fancy, you can try these other ones. Cook the quinoa according to the 3 step directions above. Heat sesame oil in a pan, add yellow onion and a pinch of salt and sauté until translucent about 2-3 minutes. Add garlic an sauté for a another minute. Add tofu, cabbage, soy sauce and lime juice, toss to combine and sauté for 3-4 minutes. Add arugula, toss to combine and sauté for another minute or two until slightly wilted. 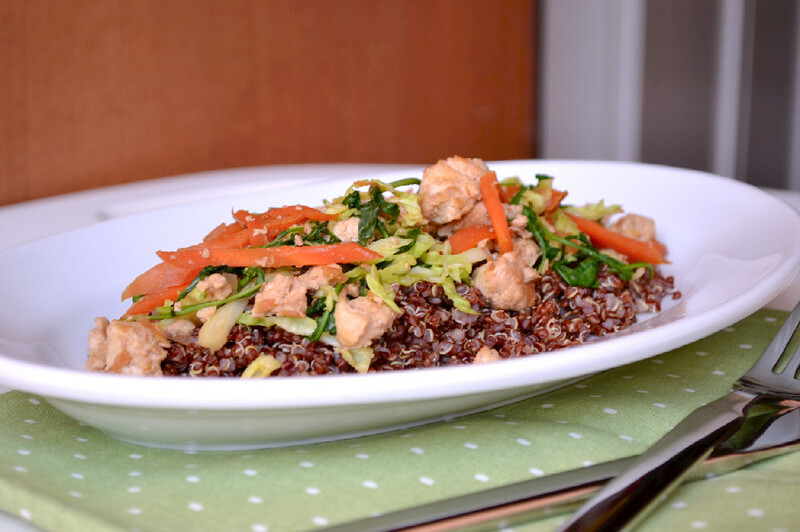 Serve stirfry over a bed of prepared red quinoa.